Microsoft announced earlier this month that it will bring a raft of new features to its mobile apps in the coming weeks. 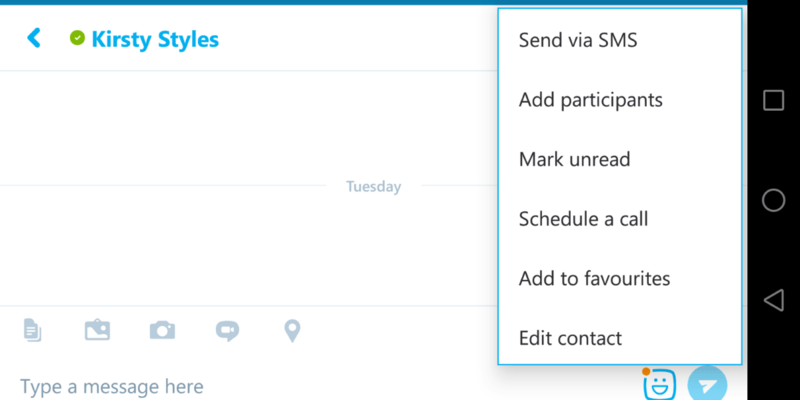 Among those additions is the ability to schedule Skype calls, which is now available on Skype for Android, but not iOS. To invoke the new option, you just need to open up a contact then hit the options button in the top right to see ‘Schedule a call’ in the list. Once you tap it, you’re bounced across to Outlook (or prompted to install it, if it’s not) to find an appropriate time for all the participants in the call. It might sound like a primarily business-facing feature, but geographically dispersed and crazily busy families might find it a useful way to schedule a catchup. Once you’ve found a time that works, it automatically generates a shareable link for joining the call when the time comes. Beyond scheduling, the Android update also brings similar functionality with Office files; allowing them to open directly in the relevant app on your phone when you click a link from within Skype – again, provided you have the Word, Excel or PowerPoint apps installed. There’s no word on exactly when the features will arrive for iOS Skype users, but you can already schedule a meeting via the Outlook app anyway.